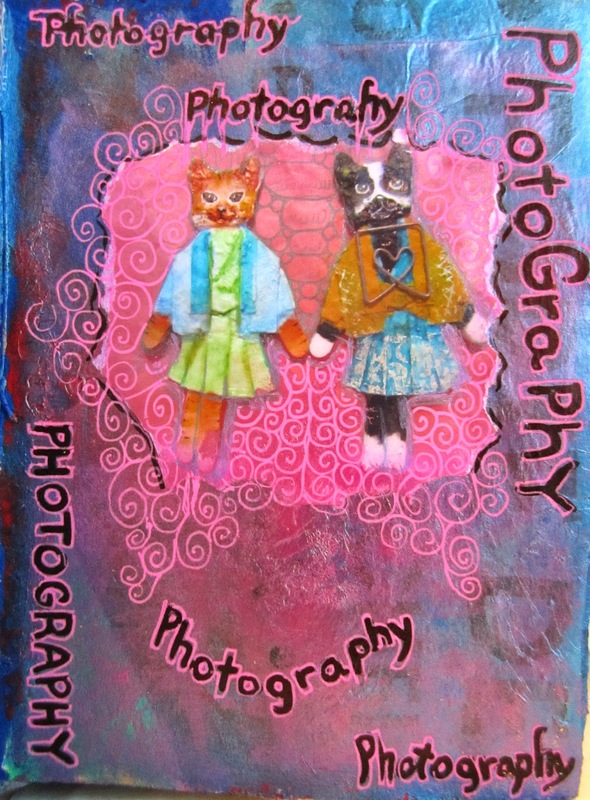 I had just finished up my Art Dolls with Popsicle Paws project (for the how-to on making these dolls, see my Frog Dog Studio post) when I saw the prompt for Journal52 that week was photography. I had already printed out the photo I took for my how-to post (using photo paper from the Dollar Store), so I thought–what the heck. Recycling part of one projects makes it easier to do more projects! This was another page where I had slathered on drips and drabs of leftover paint. I’d also glued down a strip of printed art tissue long before I knew what I’d be putting on the page. After tearing around the art dolls to get rough edges for my photo, I glued it down with Polymer medium. I squeezed out a little of Daler-Rowney’s Academy Metallic Blue and Metallic Pink acrylic paints, which are very transparent, and spread them out to unify the color. I used the blue around the photo and the pink on the photo paper, spreading it out to mix with the blue. I used a black Sharpie brush tip for the words, and outlined them with Sakura Moonlight Pink gellyroll. Then I added some doodles in the middle, and shading around the dolls with a silver Shadow gellyroll. I finished with more doodles using the pink gellyroll. There’s a lot of color vibration going on in this one, lol.